More than 140 artists, nonprofit professionals, town planners, economic development officers, performers, and citizens participated in our Shaping Community: A Creative Placemaking Conference on Jan. 23-24 at Stepping Stones Children’s Museum in Norwalk. Videos of the Day One events are available on our YouTube channel at: bit.ly/ShapingCommunity. See Liz Squillace, Cris Dam and Sandy Goldstein discussing the Impact of Public Art; see Jane Davila, Elisa Keogh and Mark Macrides on the Impact of Artists Spaces; and Cristle Chumney, Miggs Burroughs, Chris Timmons and Kristin Lessard discuss their Artist Residencies and more. Presentation slides are also available here. Christle Chumney (New Canaan Library), Katie DeLuca (Town Planner for the Town of Greenwich) and Phil Kuchma (Bridgeport developer) were representatives of 3 of the 9 working groups that soaked up the insights and lessons from LISC's Rebecca Chan, ArtPlace America's Jamie Bennett and the NEA's Jen Hughes on Day Two of the Shaping Community conference. They were our guests on the February edition of Spotlight on Arts & Culture, our monthly program on WPKN 89.5FM, February 12. Lenore Eggleston Herbst is a dancer, choreographer and nonprofit administrator. With more than twenty years of experience managing nonprofit arts organizations, Lenore is currently the Executive Director of Woodcock Nature Center in Wilton and Ridgefield. Her previous experience includes twelve years as director of marketing and development for the Westchester Philharmonic, fundraising for Ballet Tech in New York, as well as marketing and fundraising for the Kaufman Center, which operates a community arts school, a K-12 public school for gifted music students, and the renowned Merkin Concert Hall in New York City. As a dancer and choreographer, Lenore’s work has been presented at venues including the Joyce Soho, Dancespace, Movement Research and at Connecticut College. For several years Lenore also performed in windows, on staircases and around swimming pools in numerous site-specific works with Stephen Koplowitz and Company. Lenore has lent her administrative expertise to the Norwalk Symphony Orchestra and served on the board of directors at Woodcock before becoming its executive director in 2018. Lenore holds a B.A. in Dance and Psychology from Connecticut College and an M.A. in Performing Arts Administration from NYU. Moki Kokoris trained as an architect, with a degree from Cooper Union and worked for several years as an architect in New York City. She also received a diploma in piano from the Ukrainian Music Institute. In 2003, she became the first Ukrainian woman (and the 14th woman overall) to reach the North Pole. Based on these achievements, Moki became a UN representative for the World Federation of Ukrainian Women’s Organizations and has also served on UN committees on climate change. An active member of the Explorers Club, editor of the The Polar Times and author for the World Ecology Report, she founded 90-North, introducing students to the Arctic. Moki is a member of the Society of Scribes and the International Association of Master Penmen, Engrossers and Teachers of Handwriting. She has been a freelance calligrapher, artist, illustrator and graphic designer for over 40 years, establishing a notable reputation for her artistic work. 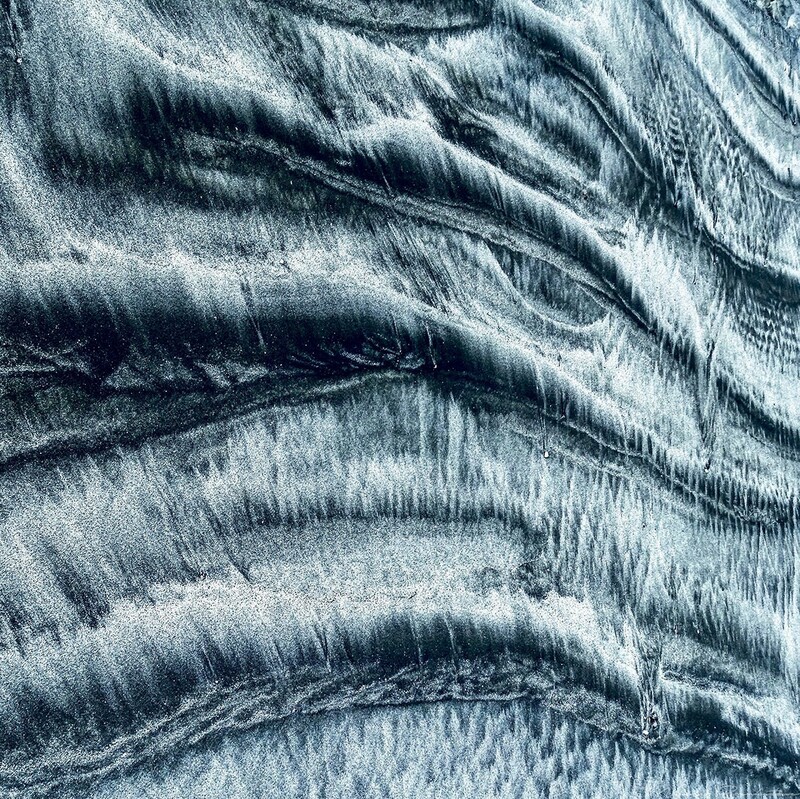 Moki is as passionate about visual arts, particularly calligraphy in its classical forms, as she is about the Arctic. In many of her high-end calligraphy commissions, she uses authentic animal skin parchment, and swan quills or reeds she often collects and cuts herself. Moki is a Ridgefield resident (and a confirmed chocoholic). She teaches at The Art Spot and other venues. See Moki's website (True North Graphics) here. Nancy Breakstone has won the Viewer's Choice Award at Fairfield Museum's IMAGES show, opening Thurs. March 1, 6-8pm, for her Threads (2017, digital photograph, 20x20, at right, click for larger image). 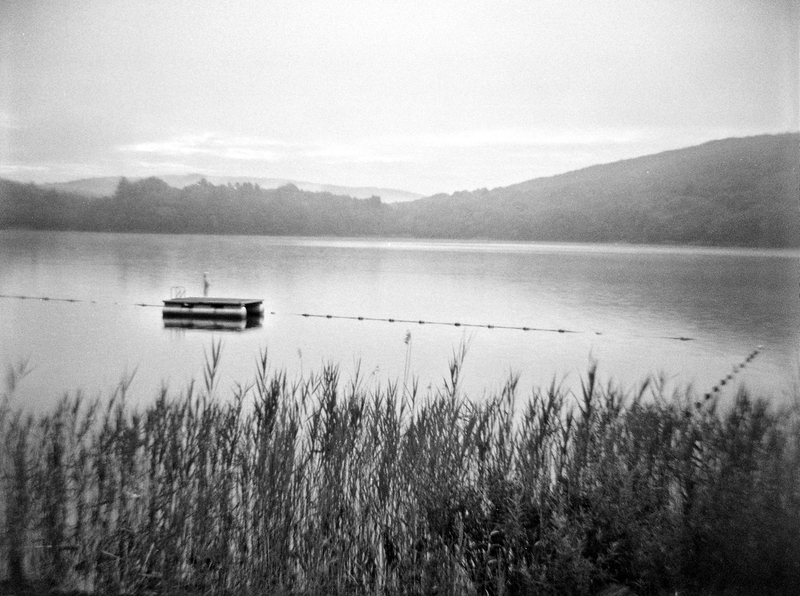 Nancy has also been accepted as an Exhibiting Artist at the Rowayton Arts Center, and is currently showing work at the Maritime Garage Gallery’s Worth a Thousand Words, the Movement exhibition at Fairfield Library's Kershner Gallery, and the Barrett Art Center’s 31st Annual National Juried Photography Exhibition Photowork 2018, running through March 24. Adger Cowans will be interviewed at a public event at the Smithsonian's National Museum for African American History and Culture (NMAAHC), Washington DC, by NMAAHC Curators Aaron Bryant (Photography) and Tuliza Fleming (Visual Arts) on Tues. Feb. 27, 7-9pm. The conversation, Historically Speaking: A Lifetime in Photographs will be illustrated by visuals from Adger's extensive photography archives. Adger will be signing his book Personal Vision: Photographs: Adger Cowans, following the presentation. Congratulations to poet Cortney Davis, whose third poetry collection, Taking Care of Time, winner of the 2016 Wheelbarrow Poetry Prize, for a poetry manuscript, has just had the book published by Michigan State University Press. Cortney's manuscript was selected by Naomi Shihab Nye, who commented that "Davis' skills as a nurse practitioner and her unflinching to-the-bone gifts as a writer mix eloquently to create a manuscript that will grip and compel readers. A great book, not to be missed." David Dunlop is giving one of his mind-expanding visual lectures at Silvermine Arts Center, Sun. Feb. 25, 4:30-6pm. Entitled Visual Thinking: Deeper, Broader, More Inventive, David will demonstrate how the most inventive minds in history used visual thinking, how you can too and how language hi-jacks your thinking and constrains creative thinking. Neuroscience has discovered we are all visual learners first. Linguistic learning follows. Linguistic thinking limits the breadth and depth of creative responses. 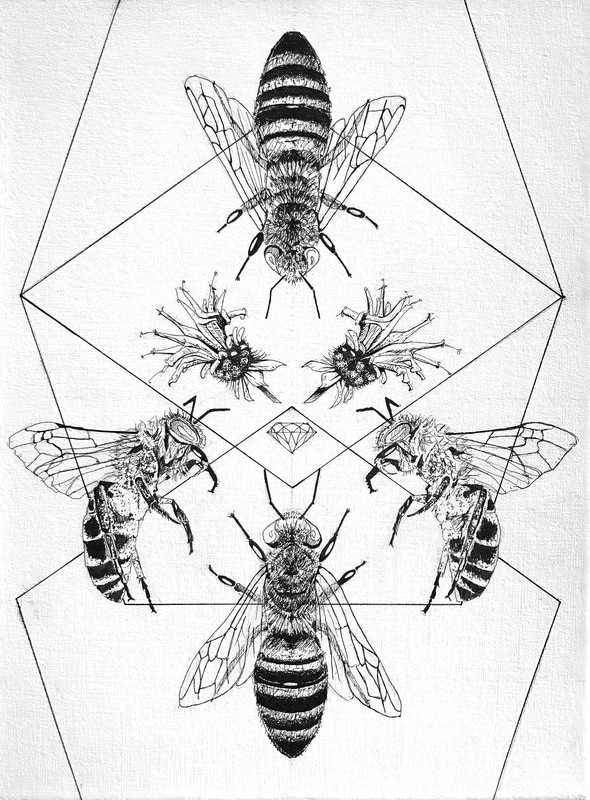 Meg Garbe received Honorable Mention for Bees, one of her two pieces accepted for the Rowayton Art Center's annual, juried Beyond Brushwork exhibition running through February 25. 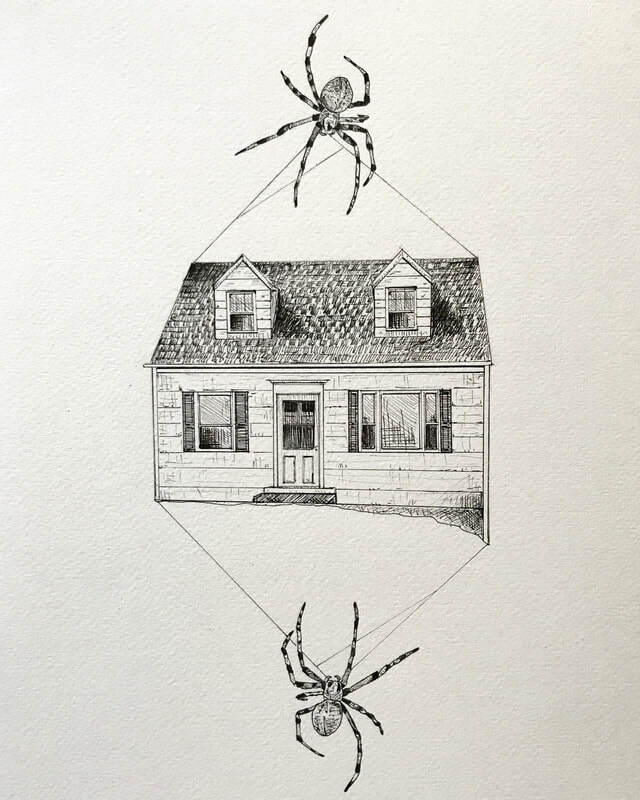 At right, Bees, (2017, pen on canvas, 12x16, detail at right, click for complete image), and House Made Out Of Spider Webs, (2017, pen on paper, 12x9). 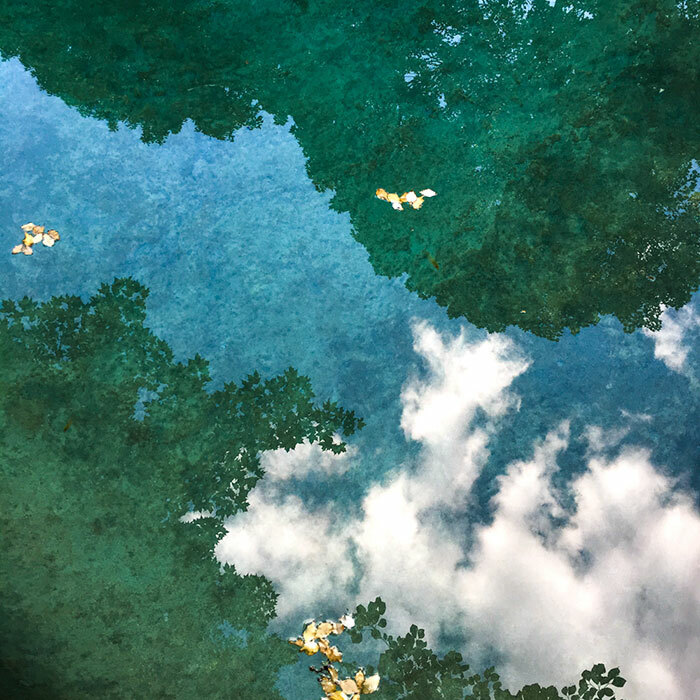 Ellen Gould had her photograph, Temple of Bosch (2018, digital photograph, 30x20, detail at right, click for complete image) accepted into the Fairfield Museum's Images 2018 exhibition, opening Thurs. March 1, 6-8pm. Ellen comments that she is "always on the lookout for a different slant for a photo in my kitchen. The architecture surprised me!" Len Grayeck's Miscere Domino (2016, acrylic on canvas, 30x40, detail at right) has been purchased by the Mattatuck Museum in Waterbury for their permanent collection. Len's painting was included in the Mattatuck's I Believe In Waterbury exhibition last fall. 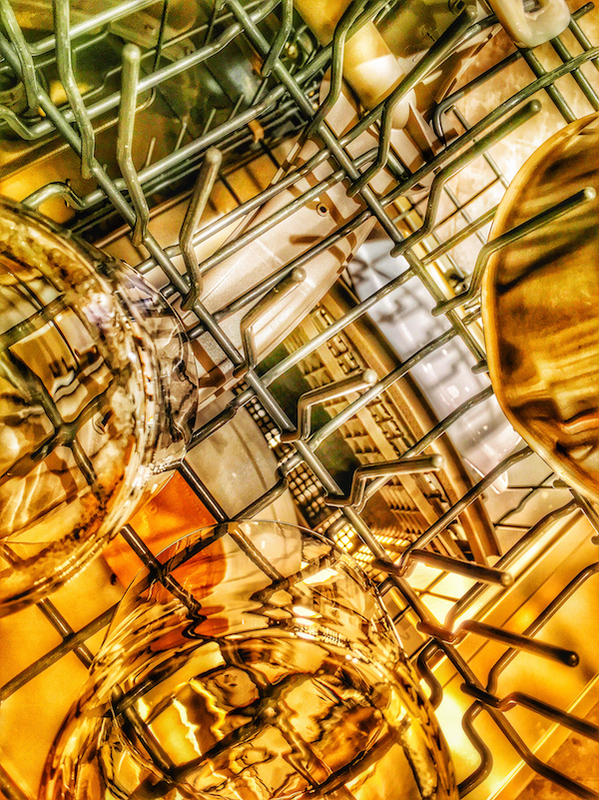 Len commented that the title of the piece roughly translates to "Mixmaster" and depicts a scene he experienced one late afternoon while visiting the Mattatuck Museum. MaryEllen Hendricks has a solo show, Thin Places at The Gallery at Greens Farms Church. According to Celtic tradition, the physical and spiritual worlds, are never very far apart. The distance can be tissue thin. MaryEllen writes that she noticed how these cherished locations would figure in the stories of friends and acquaintances, especially when they faced challenges or crises. At right, JC Thin Place (2015, photograph on silk, 8.5 x 11, click for larger image). MaryEllen will speak about her work at a closing reception Thurs. March 29, 10am. Katya Lebrija is in a 2-person exhibition, with Valery Sutherland, at the New Canaan Library, opening with a reception, Thurs. Feb. 22, 6-8pm, and running through April 8. Destinations is dedicated to the idea of a journey to real and imaginary places. At right, Katya's Marina (2017, mixed media on canvas, 60x36, detail at right, click for complete image). Katya says her exploration with abstraction is taking her into imaginary places, where the viewer can appreciate a seascape or a landscape or a road that leads somewhere. Ellen Schiffman has a solo exhibit of her work at the Mercy Gallery in Windsor, CT, from Feb 20th – April 15th. Following the Thread: Inspiration from The 52 Box Project, follows Ellen's yearlong series of experimental and exploratory mixed media shadow boxes. Along with the boxes will be many of the pieces and series informed by the boxes in the years since. She says, "The 'boxes' set the stage for an inspired, productive and exciting period of artistic growth, which I will be sharing in this show. Hope you can visit!" At right, nine of Ellen's 52 boxes. Vin Verrillo is the Fairfield University Bookstore's Artist of the Month and has a selection of his paintings and photographs in the bookstore's stairwell art space (at right). Vin comments that he likes the freedom of flow within form, using definite distinct rich and vibrant colors with a subtle urgency. His paintings and photographs often have a dreamlike quality, not pretty but graceful." The show is up through Feb. 28. Joan Wheeler is exhibiting her needle-felted wool piece, Prophecy (24"x30" detail at right, click for larger image), in Material: An Exhibition of Fiber Art from Across the Country. This piece was selected from over 400 entries and will be shown at the d'Art Center in Norfolk, Va., from Feb. 20-March 29. Tues. Feb. 20: Ellen Schiffman, Following the Thread. Mercy Gallery, Windsor, CT. Opening Reception, 6:45-8:45pm. Thurs. Feb. 22: Katya Lebrija in 2-person show, Destinations, New Canaan Library. Opening Reception, 6-8pm. Sun. Feb. 25: David Dunlop, Visual Thinking, Silvermine Arts Center. Lecture, 4:30-6pm. Tues. Feb. 27: Adger Cowans, Historically Speaking: A Lifetime in Photographs, National Museum of African American History and Culture, Washington DC. COnversation, 7-9pm.